Simple, durable and reliable, EVA mats offer insulation and basic comfort. These can be rolled up and secured with elasticated bands for carrying and storage. From neat EVA foam outdoor seating and sleep comfort solutions to airbeds with built-in pumps, Easy Camp has simple, effective designs that won’t break the bank. Lightweight, durable and reliable, all pack down small for storage and transport and add practical comfort to life outdoors on and off-site. Happy campers want to sleep well each night to make the most of holidays. Comfort solutions from Easy Camp make sure they can with value for money design options. 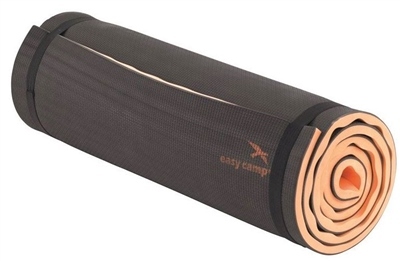 Easy Camp camping mats and airbeds offer outstanding value options to suit all styles of tent living and fun outdoors with top comfort levels that campers can rely on. From closed cell foam mats that roll up for easy transport to reliable inflatable designs that offer more comfort, the choice is wide. Self-inflating mats are just unrolled and a valve opened, Flock airbeds with soft-to-touch velour gives you comfort. A handy Folding EVA seat offers extra comfort on picnics, at festivals or outdoor events.